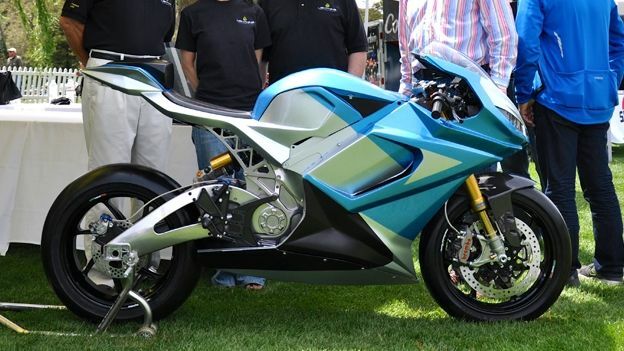 Lightning has announced the availability of the LS-218, its first official production electric motorbike that also happens to be the fastest production motorbike in the world. The LS-218 is a production version of their original racetrack version which generally put the hurt on anything that wasn't running on batteries after it not only set a land speed record (215) but then promptly bested that during the elite Pikes Peak race (218mph). This then is a vehicle that - whilst requiring a plug socket overnight - will punish even the slightest hint of underestimation. In case you're wondering (which you probably are), all that power comes courtesy of a liquid-cooled 200bhp electric motor which is then powered by the batteries giving you a range of around 180mph. Due to the sheer amount of batteries needed the LS-218 isn't exactly light-footed, but despite its 225kg weight still manages to boast a face-contorting 168 ft-lb of torque so we wouldn't worry about being shown up at the red lights. The bike goes on sale this summer in the US for around $40,000 and if you're still not convinced then Lightning managed to set the world record using just $0.08 worth of electricity. If that isn't saving the planet we don't know what is.